Wonder how a real life couponer shops? 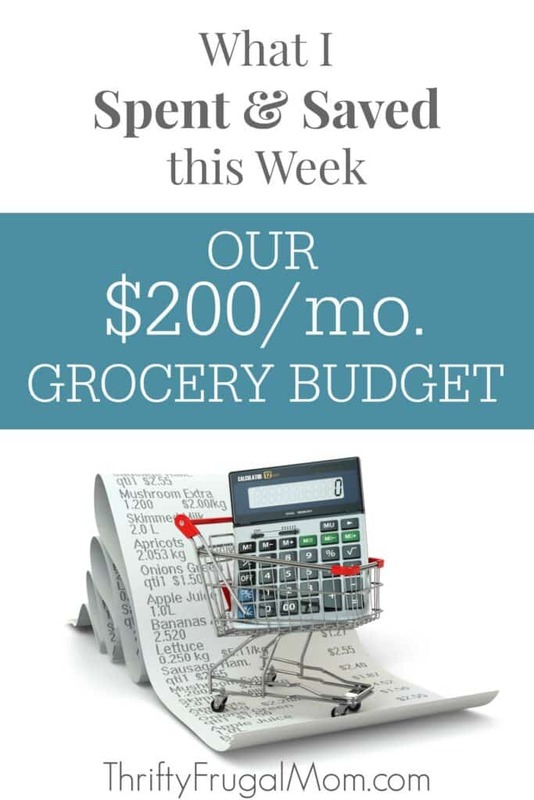 Let me show you the details of my $200 a month grocery shopping trips and teach you the things that I do to save and live well on a low grocery budget with my family of six! If you are new here and unfamiliar with my What I Spent & Saved posts, it probably is helpful to understand a bit about how I shop. I do something called stockpile shopping. This simply means that when I see an item at rock bottom prices that I regularly use or know that I can use, I’ll buy several of it. This might seem kind of crazy, but it honestly saves me hundreds of dollars a year! Simply put, by buying 6 bags of frozen veggies when I can get them for $0.50/bag with a coupon and sale instead of paying the full price of $1.50, I save $6.00. This savings adds up pretty quickly! Want to know more about this kind of shopping? Check out my post on How to Start Building a Grocery Stockpile. I also buy meats and veggies in bulk. The meat I either can or freeze and then obviously have it on hand whenever I need it. I purchase large quantities of fruits and veggies when they are in season and I can get them at really great prices. By canning or freezing them, I save a lot and we are able to enjoy great produce for less cost all year long. I do still buy some fresh fruits and veggies too. In fact, every 7 to 10 days I go to our local farmer’s market and get several heads of lettuce so that we can enjoy salads at least 4 times a week. I hope that helps you make sense of some of this. I realize at first glance it can look like we eat rather strangely but I think we really eat quite well on a budget! Of course, if you have any questions feel free to ask them in the comments! I’ll be more than happy to try to answer them. It’s been a long time since I’ve done one of these spending summaries, partly because some weeks the deals have been a bit slim and other weeks because I simply ran out of time to post. But….I’m excited about sharing my Giant and CVS trips this week. Hopefully, even if you don’t have a Giant or CVS and can’t recreate the deals, you can still get some tips that are helpful to you! And just to be clear, the Giant deals that I did are good through 11/17/16 and the CVS deal is good through 11/19/16, so you should be able to get the deals yourself if you want to. What a fun week at Giant! By combining various coupons, sales and other promotions I was able to get all of the things you see in the picture above for just $4.86!! I can hardly believe it myself, actually. I’m used to getting good deals, but they aren’t often quite this good. So, here’s the breakdown. 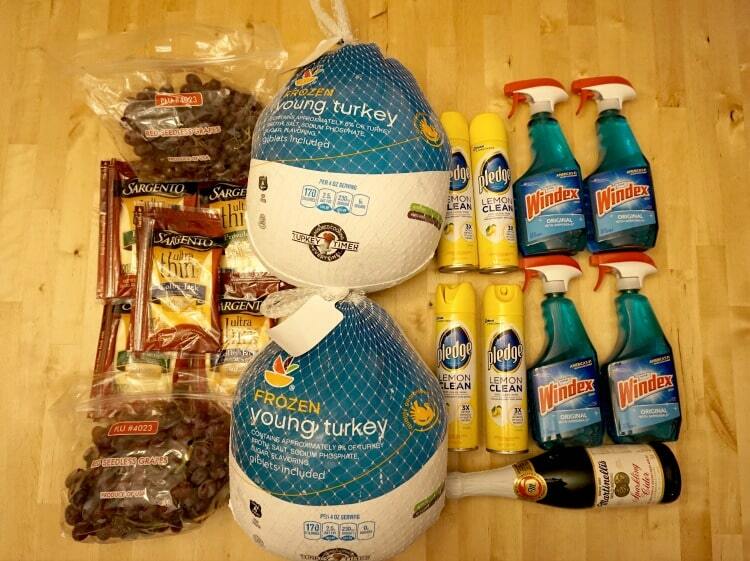 The Windex and Pledge were part of Giant’s gas reward sale items. That meant that in addition to being on sale, for every 4 of those items that I purchased, I earned $10.00 back in gas rewards. Plus, there were 2 catalina promotions for these items too, which saved me another $4 on a future purchase. And on top of that, there is a $5 gift card offer that SC Johnson is doing and I qualified for that too. So, to break it down even further, I spent $27.12 in the Pledge and Windex, saved $12.00 with printable coupons, saved $5 in catalina coupons, will get back a $5 Mastercard gift card and will have $20.00 to use on gas. Which means that by purchasing the Windex and Pledge, I really made $13.88! The Sargento sliced cheese ended up being $0.89 each after coupons and sales. Again, I was able to save significantly by combining sale with coupons. That is one of the key ways that I save a lot! The grapes ended up being just $0.99/lb. thanks to an in-ad coupon and the Giant turkeys were only $0.39/lb. since I purchased $25 worth of other groceries too. That some cheap meat right there! And I love that I’ll be able to use the bones to get lots of great homemade chicken broth too! The Martinelli sparkling cider was the only thing that wasn’t a super bargain, but I bought it anyway because our 10th anniversary is this weekend and we are going to be doing some things to celebrate and I thought that this would fit in well with our plans. 4.74 lb. red seedless grapes $1.99/lb. – they were on sale for $0.79/lb. but if you purchased $25 worth of other groceries they only were $0.39/lb. Since using cloth diapers is one of the 12 money saving things I don’t do, I love watching for great deals on disposables. 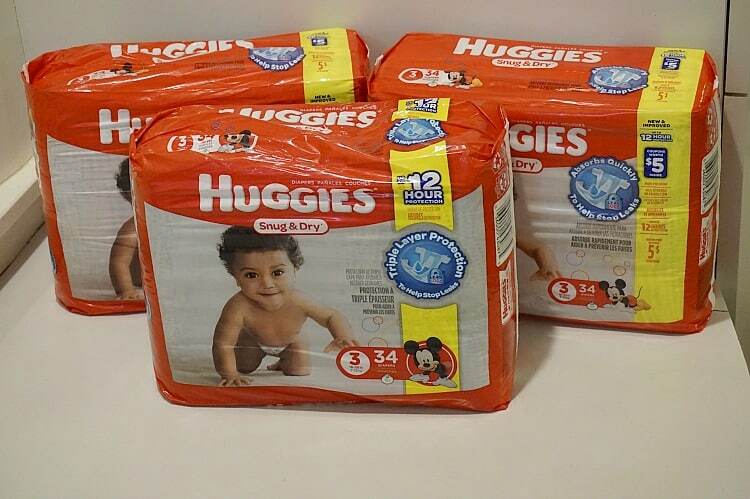 This week I was able to get 3 packs of Huggies for $4.66 a pack. I try not to spend more than $5 a pack for diapers, so I was pretty happy to be able to stock up again at this price! What a great deal on the Turkey and cheese! Do you ever log on to your account on CVS.com for the CVS coupons? or use their app? I regularly get CVS coupons for $5 off a $25 diaper/wipe purchase. I use those in addition to coupons and the savings add up! Emily, the whole CVS coupons thing is a sore subject for me. :) Years ago I got lots of coupons from them and it was awesome. Then suddenly they stopped. I finally downloaded the app several months ago thinking maybe that would give me some coupons and I did get a few, but never the diaper ones. Now the last several weeks I don't even have any coupons there anymore! I think they have something against me! ;) But thanks for mentioning it, because other readers may be able to take advantage of the coupons there. They often do have really good savings for most people, from what I can tell! So I don't coupon much. But any coupon I've ever seen says it can't be used on sale items, or doubled. In other words, one coupon per transaction (for the same item.) Is this only true of manufacturers coupons?! I heavily coupon and while some coupons DO have it printed * do not double* the majority I see/use do not have that printed. Some major suppliers have a clause on their coupons that reads * not to exceed 4 coupons used per transaction* but I have never seen a manufacturer coupon that said it was not to be used on sale items. If my store has a great deal on an item I have coupons, and the store abides by the set # of coupons per transactions.. I simple split my order into as many transactions I need to stock up on the deal! My local store that doubles coupons had its own daily limits on coupons where they will only accept 8 same coupons per day.. Since we swipe a loyalty card it tracks me. So if there is an amazing deal I will just stop in a few times that sale period to stock up... If I am really desperate and fearful I will not find the items again because of the demand.. I will maximize my coupon limits and then do a separate transaction using my moms card! Sure she gets the gas points on my purchase.. but I get the killer deals! Sarah, sorry for the slow reply. Things have been a bit crazy around here with closing on our new place in Philly, getting ready for Thanksgiving and being away for several days (with no internet) and now getting ready to move. When you say that you haven't seen coupons that can't be used on sale items etc, are you talking manufacturer coupons such as the ones from Coupons.com or are you referring to coupons that come to you from say a store like JCPenney or Darrenkamps? Manufacturer coupons like I use from places such as Coupons.com, almost always are allowed to be used on sale items and they rarely state that they can't be doubled. And even sometimes that ones that do say Do Not Double, will actually double at Giant. (Which, to my understanding, the issue of Giant doubling them anyway is their issue because they are the ones that "lose" the doubling money for any coupon, not the manufacturer.) Even store coupons from places like JCPenney or local grocery stores often allow you to use the coupon on sale products. Department store coupons typically have a list of brands that you can't use their coupons on, which is a pain, but I've rarely seen any that limit you to only using the coupon on full priced items. Hope that helps! And please keep the questions coming if you have them. :) Oh, and if you are interesting in experimenting with couponing at Giant or other stores, check out Forthemommas.com They do what they call coupon matchups for major grocery and drug stores and show you exactly what coupons to use for each item. It's a huge time saver and very helpful. How did you get 5! Sargento cheese coupons? I've always been able to print only one. That's a good question, Jolynn! First of all, you should be able to print each coupon twice. After you print one, try going back to the main page again and looking for it. Every now and then, they'll make it a little more difficult and push it way to the very end of the available coupons, which is a pain because you have to scroll through all the pages. Also, if you have multiple computers, you can print 2 coupons from each one. That's how I got 5. We have 2 computers, so I printed 2 from each of those and then I happened to have one coupon left from when they were available about a month ago and I had printed some then. The verbiage on the coupon is actually no more than 4 like coupons per customer, or something like that. BUT the one coupon that I had left from the previous time it was available was specifically for the Ultra Thin slices and the others weren't, so they were technically different coupons, which allowed me to uses them all. Are you confused yet?! :) In all seriousness, I hope that made sense! And if not, please keep asking questions until it does. Sometimes I find that this stuff is so normal to me that I forget that not everyone knows all the basics. Also, another reader commented on my Facebook page and said that you can now print from mobile devices too! I haven't had a chance to give that a try, but that would be another way to get more prints of a coupon. Sadly our stores here in Fl wont double coupons. We have a Publix that have penny deals in other states but they don't do that here either. They often have some good BOGO's but haven't had much luck with couponing. I am so excited to find you. Thank you for doing this. I am trying to save money while living in Washington D.C. with my hubby and two kids. I am a stay at home mom, so obviously I need to be tight on budget. One question is do you buy organic food? I mean all food? If some, how? Or if no, why? I am trying to buy organic food often, but they are quite expensive. I'm glad to have you here, Kelly! And I bet D.C. is a pricey area, am I right? We recently moved to Philly and while I can still do decently on groceries the cost of a lot of other things is higher than where we previously lived. As far as your organic food question. I do not focus on buying organic food. While I don't doubt that it is better for you, right now we simply don't have the budget for it, because like you said, it quickly gets to be quite expensive! If I can find organic items for cheap, then I definitely buy them. But mostly, I just try to cook from scratch and make my own foods as much "convenience foods" as possible. (Things like Homemade "Cool Whip", Homemade Cream Soup, Homemade Cake, Homemade Yogurt etc.) I do try to avoid high fructose corn syrup and avoid GMO foods as much as possible. I also am excited about starting to make my own kefir, which is a good natural, inexpensive way to get probiotics and I think that should help keep us healthy too! Organic foods is one of those things that everyone has to figure out how important it is for them. Like I said, with my husband being in school, for us right now, we simply don't feel like we can afford it and because we eat mostly from scratch food and lots of fruits and veggies, I feel good about that decision. If you do want ideas of ways to save on organic food, you might find this post helpful though!